This chapter focuses on disability and barriers to inclusion in sport. It begins by re-imagining disability and sport within society. By offering an account based on the 2012 Paralympics, readers are invited to reflect upon how society could embrace utopian values that support and respect difference. A central feature of this utopian society is working towards inclusion, and this notion is considered in relation to society and sport. After this, a range of barriers to inclusion in sport by disabled people are outlined including attitudinal and structural barriers. 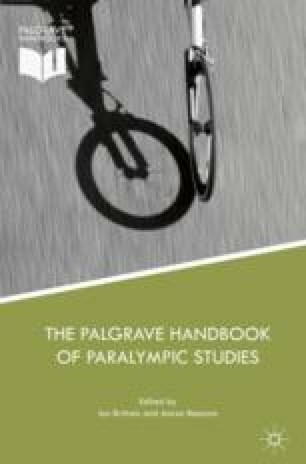 In concluding, this chapter highlights how barriers to sports participation are inextricably linked to wider societal views and expectations of disabled people. Moran, E. Thomas, and Martin E. Block. 2010. Barriers to Participation of Children with Disabilities in Youth Sports. TEACHING Exceptional Children Plus 6 (3) Article 5. http://escholarship.bc.edu/education/tecplus/vol6/iss3/art5. Accessed 1 July 2015. Norman, Will. 2012. Has the Paralympic Flame Sputtered Out? http://www.theguardian.com/commentisfree/2012/oct/09/paralympic-flame-legacy. Accessed 5 August 2015. World Health Organisation and World Bank. 2011. World Report on Disability. http://www.who.int/disabilities/world_report/2011/report/en/index.html. Accessed 5 August 2015.